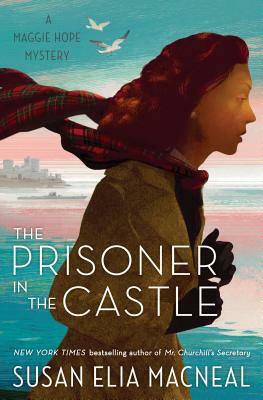 The Prisoner in the Castle is the eighth book in the Maggie Hope historical mystery series, set during WWII in Great Britain, and it is a thrilling tale of suspenseful trepidation. The author’s tight control of the tension and plot allows a myriad of possibilities to engage the reader while avoiding frustration. It is a story that keeps the reader on the edge of her/his seat and turning the pages as quickly as possible to find out who the cat among the pigeons is. The cast of characters that MacNeal introduces to this plot are fascinating, and each is a viable suspect in an escalating sequence of murdering off British SOE agents one by one in a secluded location. The suspects, victims, and killer are all gathered in one inescapable place, and anyone seems to be a target for death, as the killer remains hidden in plain sight. If you aren’t already thinking about Agatha Christie’s And Then There Were None yet, you will be when you read MacNeal’s cleverly spun rendition. Our favorite spy, Maggie Hope, is one among a handful of British SOE (Special Operations Executive) agents who have been sent to Scarra Island, off the coast of western Scotland, because they have been deemed in possession of too much information or have made a move of some sort that steer a select few in charge to determine the agents too high of a risk to continue to serve or keep amongst the general population. The island is uninhabited except for the prisoners and the housekeeping staff, a husband, wife, and son originally residents of the island before the island was bought by a peculiar English lord, who wanted no one on the island but whom he invited. Sir Marcus Killoch has been dead for some time, and the British government has taken over the island and Killoch Castle to use as a “cooler” for the agents labeled too hot to be on the loose. Although not restricted to the castle and allowed to roam the island, there is no mistaking that the agents are prisoners. Maggie is both infuriated and frustrated, as she hasn’t done anything wrong, and would take the information she knows about D-Day to her grave. She has effectively been taken out of the action in 1942 during a time Great Britain could use all the highly trained SOE agents it has to undercut Hitler’s advances. No one knows where Maggie or her fellow prisoners are, except for a few well-placed officers in the SOE operation, including Colonel Alistair Rogers at Arisaig House, a former Scottish hunting lodge being used as the training site for British SOE agents, and Colonel Gaskell with F-Section in London. Although no one knows her location, there are those looking for her, notably Chief Detective Inspector James Durgin, who unexpectedly may need her for the trial of the notorious Blackout Beast, from a previous Maggie Hope story, The Queen's Accomplice. There is no means of escape from the island, as the only boat visits the island once a month with supplies and then returns to the mainland. It is a wilderness of three square miles, and someone on it is not who he/she claims to be. WWII was a war fought on many levels, and spies were an integral part of the effort, by both sides. The spies who occupy Scarra Island are all well-trained in subterfuge and combat skills, so when the SOE agents start being murdered one by one, Maggie knows that anyone of them is capable of the acts. But, motive is the bugger. Who among them has the motive to remove all the others from play? The methods of the murders are as varied as the victims, and if Maggie can’t discover the why, the who might be impossible to crack, too. While Maggie is able to gain access to the castle’s radio connection to the mainland, hope of outside help is dashed when a storm unleashes its fury on the island, making rescue impossible. It’s complete isolation at its most intense, and it’s up to Maggie to use any and all her training to uncover a master of deception and death. So many aspects of this novel reveal Susan Elia MacNeal’s talent as a master of enthralling storytelling. As the setting is on an island in the sea, I can’t help thinking of a comparison between a wily fisherman controlling his fishing line, reeling it out and back in at just the right moments, the twisting and turning of the line, and the revelation of the prize fish when the dance is over. MacNeal controls the story just as tightly, and as patiently. Nothing is rushed, although the action is always moving forward. The characters are deftly developed from their first innocuous appearance to the depths of their bared souls. The setting in its perfect closed room isolation is described by MacNeal, from the wilds and beauty of the island to the cold, calculating architecture of the castle in detail adding to the action, not unnecessary color. The historical research that the author conducts for this series clinches the authenticity element. The reader is fully engaged in the story from the chilling prologue to the unnerving ending. Prepare to be impressed. I received an ARC of this book and in return have given my honest review of it.